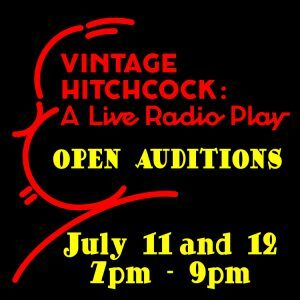 SOUTH HOLLAND, IL – The PAC Rats Theatre Company of South Suburban College will hold open auditions for Vintage Hitchcock: A Live Radio Play. The auditions will take place on July 11 and 12, 2018, beginning at 7:00 p.m. Readings will be held in the Kindig Performing Arts Center on the main campus at 15800 S. State Street in South Holland, IL. Playwright Joe Landry has adapted three of Alfred Hitchcock’s earlier films into suspenseful dramas in the style of a 1940s radio broadcast. The Lodger, Sabotage and The 39 Steps form a triple feature that recreates a daring train chase, a serial killer’s ominous presence and a devastating explosion complete with live sound effects performed on stage. Wagner is planning evening rehearsals. Performances are scheduled for September 21 and 28, 2018 at 7:30 p.m. and September 22, 29 and 30, 2018 at 2:00 p.m. In addition to acting talent, the PAC Rats are also seeking volunteers to create the many live sound effects or who want to try their hands backstage, building and painting scenery. If you want to get your feet wet with something small or large, this is your opportunity! Auditions are open to all community members as well as SSC students, aged 18 or older. Appointments and prepared audition materials are not necessary. Auditioners will read from scenes, which will be available at the time of auditions. Copies of the script are on reserve in the SSC library. Everyone is welcome to attend both auditions. Be prepared to list all conflicts with the rehearsal schedule. For character descriptions, rehearsal schedule and more information, visit the Kindig Performing Arts Center’s website at http://learn.ssc.edu/theatre/ or email ssctheatre@ssc.edu.